Handheld Humidity Measuring with Astro-Pi #piday #raspberrypi @Raspberry_Pi « Adafruit Industries – Makers, hackers, artists, designers and engineers! The main theme of our winning entry for the Astro-Pi completion was detecting the ‘sweaty astronaut’ using the HAT’s humidity sensor. 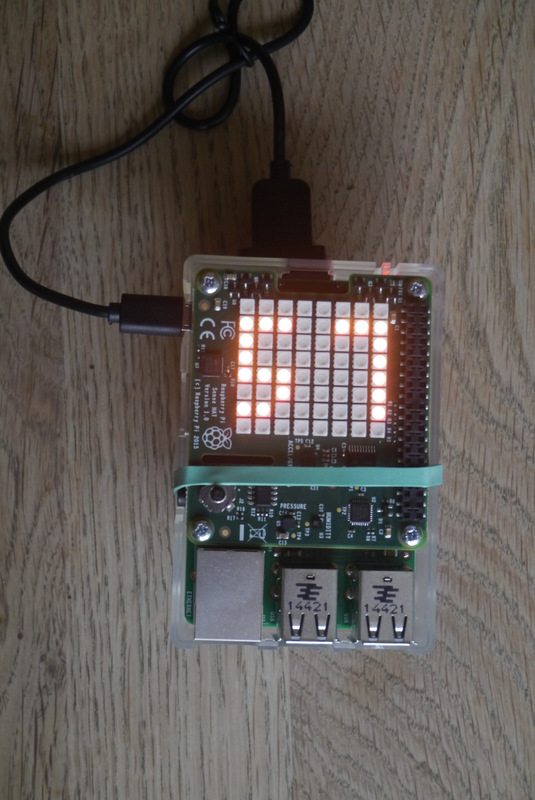 To test how this might work, and to build a simple demonstration for the CodeClub team, we wrote some Python to use the Astro-Pi’s awesome LED matrix to display the latest readings from the humidity sensor. Adding a battery pack turns this into a useful hand-held humidity sensor (you could easily use it as a thermometer instead with a minor code change). The code changes the colour of the displayed numbers based on the previous reading. If the humidity has increased then the digits are green, if it has decreased, they’re red, and (you guessed it) orange if there has been no change. The code also logs the humidity out to a file, so you can plot humidity against time. Here is 24 hours in our house. 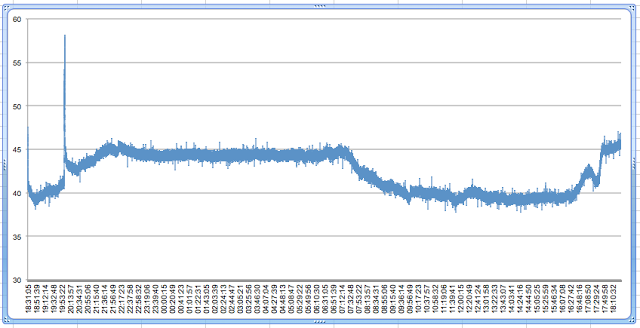 The big spike near the start was due to another ‘breath test’.